Guys, it’s been a week! I got back from California last Saturday and have basically been useless since the moment I landed. First off, I had jet lag like whoa. I slept for over 15 hours in one day, but I was still exhausted for no less than 3 days. I don’t know how you travelers cross time zones with ease because it literally wiped your girl out. Then I woke up with a horrible sore throat and earache, which turned out to be strep and a double ear infection. It’s been fun times over here. And I totally blame with the plane ride for ruining my week. Speaking of planes, can we discuss middle seat etiquette for just a second? On my way to California, I was in the middle seat, which was obviously a mistake to begin with because I’m an aisle girl. I didn’t book the flight for myself, and I didn’t want to be a complainer, so I just went with it. Which was clearly mistake number two. I was in the middle of two business men that were on their computers the entire time, which was totally fine. BUT, they both kept infringing upon my arm rest space. And that my friends, was totally not fine because I pretty much had to sit with arms crossed in front of my body like a contortionist for over five hours. Then one of them spilled a cup full of icy bourbon down my entire leg and into my shoe. Airplane foul like whoa. Needless to say, I upgraded myself to first class on the way home, which was literally the best $120 I’ve spent in a long time. As bougie as the warm wash cloths are, I totally understand them now. And to be honest, the chorizo omelette they served me was pretty legit too. Basically, I’m never going to be able to fly coach again. Which is hilarious because I typically fly budget airlines that don’t even have first class and make you pay for peanuts. Since I was wiped out and then got sick, Eric and Elle have basically been eating whatever we had on hand for dinner. Let’s just say it’s been a week of chicken nuggets and cereal, okay?! 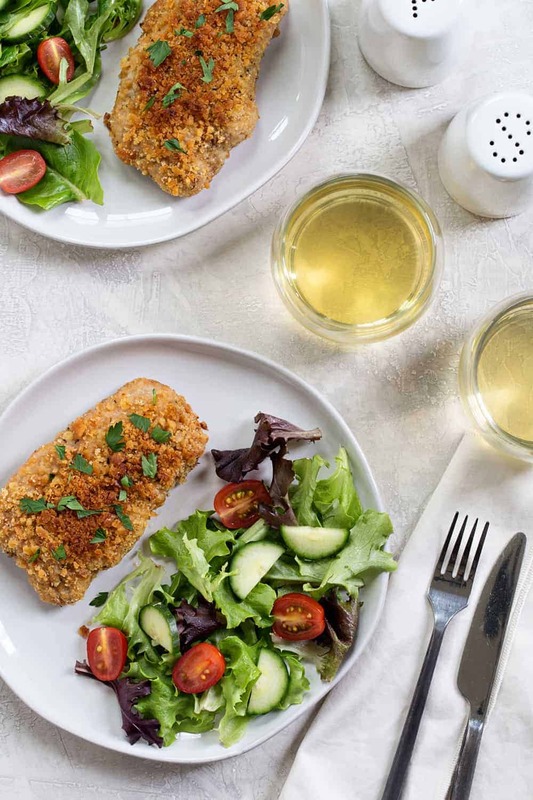 Because I’m finally feeling a little better, I decided to whip up these easy baked pork chops for dinner this weekend. 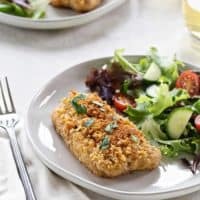 They’re basically a pork chop version of my Ritz cracker chicken, so they’re super simple and incredibly delicious. You really only need a handful of ingredients: Ritz crackers, eggs, seasoning, pork chops and butter. 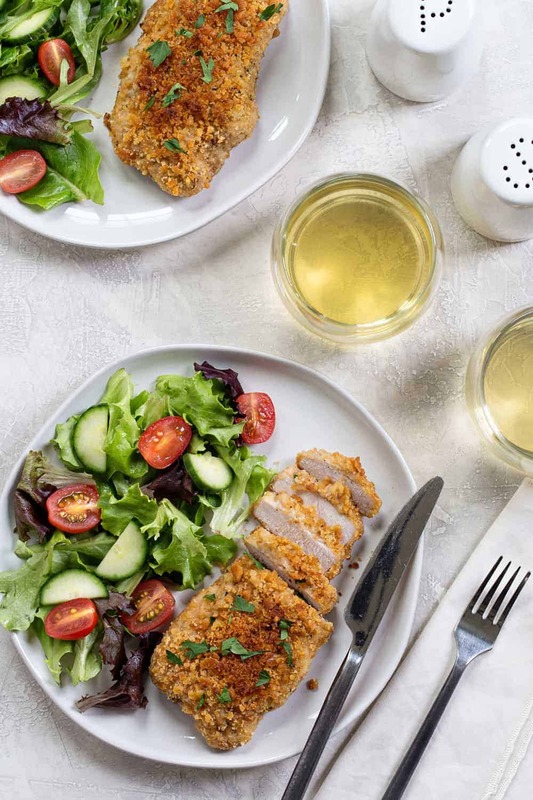 If you can find the garlic Ritz crackers, I highly recommend them for these easy baked pork chops. And they’re pretty dang amazing with spreadable cheese too! How long do you cook baked pork chops in the oven? 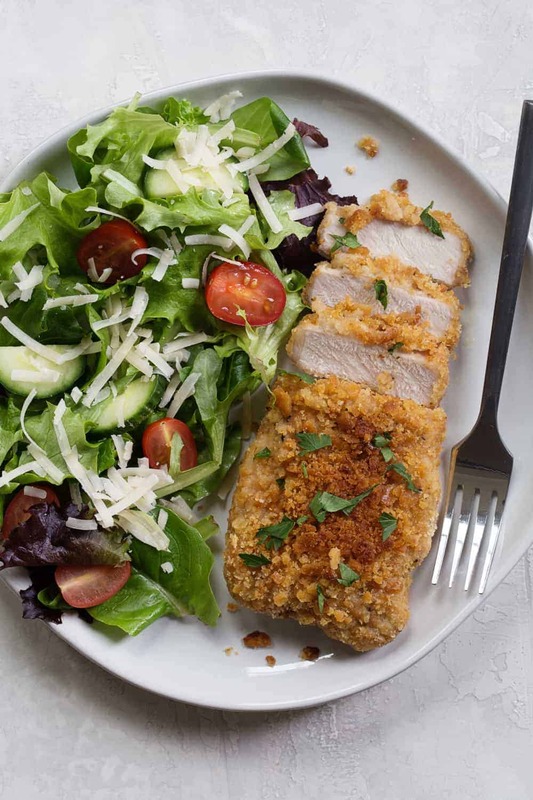 I have to admit, I used to be kind of intimated to make baked pork chops, but now I find them to be as easy as chicken breasts. 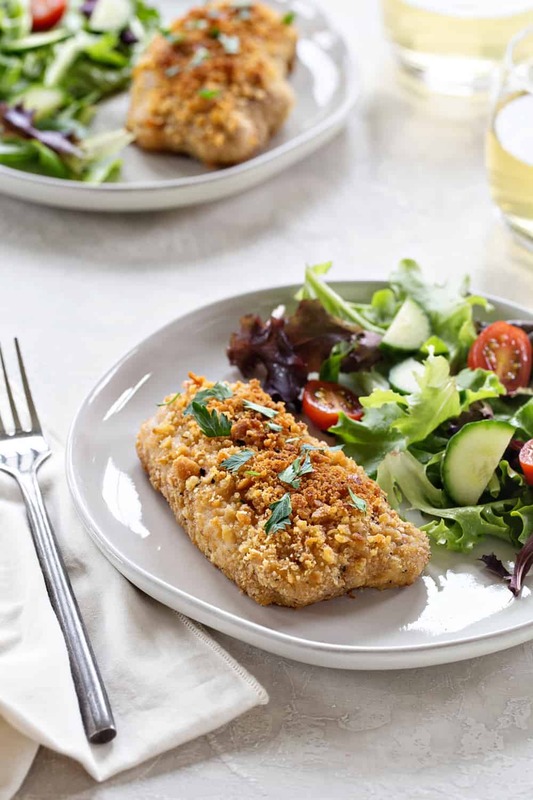 Since pork chops vary in thickness, there’s really no exact time that you’ll need to bake these easy baked pork chops. Mine were about 3/4-inch thick and took about 25 minutes. I typically rely on a digital thermometer to ensure that I am not overcooking or undercooking my baked pork chops. Keep in mind that the recommended temperature to cook pork to is 145°F, followed by a 3-minute rest. Watch your thermometer for that 145°F, then remove the baking dish from the oven and let them sit for 3 minutes before you serve. You should have your sides ready to finish and plate during those 3 minutes. What to serve with pork chops? 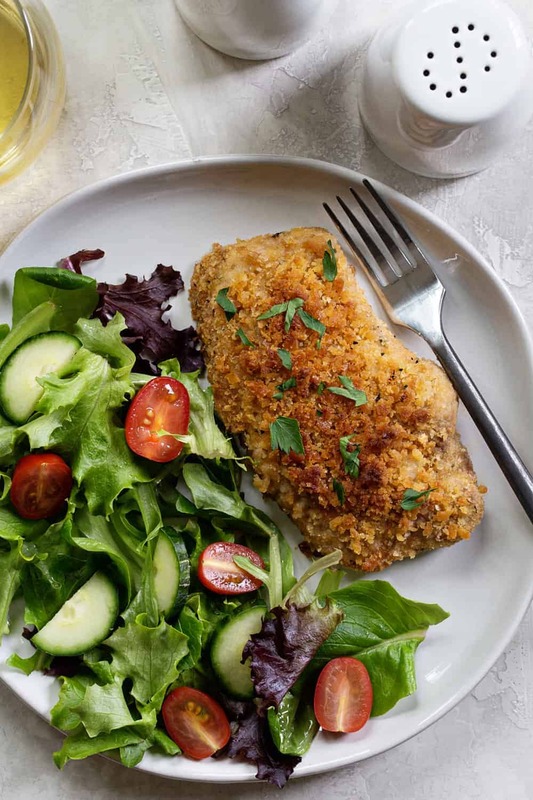 We’re pretty simple around here, so we love these easy baked pork chops with butter and herb noodles, or mashed potatoes and a crisp green salad or maybe these twice baked potatoes. 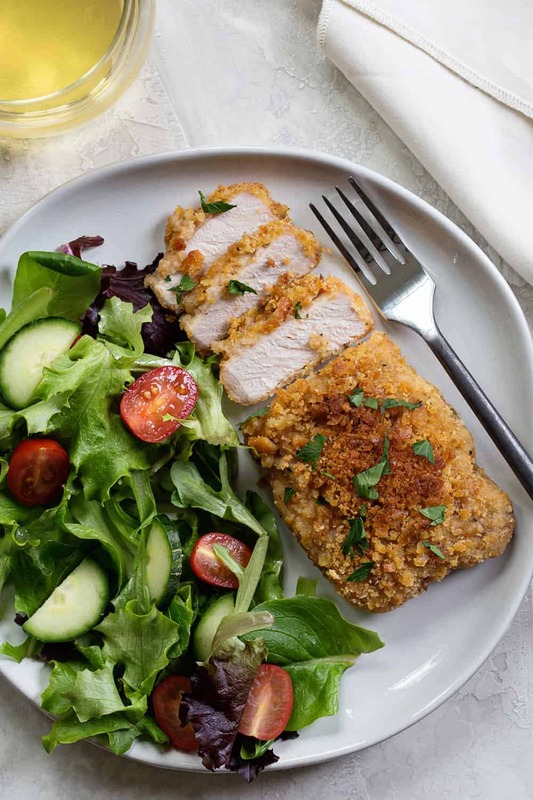 Weeknight pork chops are an easy peasy way to get dinner on the table, and I’m not ashamed to admit that after the week from heck, they were exactly the kind of comfort food I needed to perk everyone around here up. I hope they’re just as comforting for you! For more delicious dinner ideas, be sure to check out this Stuffed Pepper Soup and this Easy Chicken Chili! Place beaten eggs and cracker crumbs into two separate shallow bowls. Add garlic salt, black pepper and Italian seasoning to the cracker crumbs and stir to combine. Dip each pork chop into the eggs and then into the crumb mixture to completely coat the pork chops. Arrange the pork in a 9×13-inch baking dish and arrange cubes of butter around and on top of each chop. Bake in preheated oven for 25-30 minutes or until the internal temperature of the pork chops reaches 145°F. My pork chops were about 3/4 inch thick. The thicker your pork chops, the longer they will take to cook, just be sure to make sure the internal temperature reaches 145°F. Hope you’re able to feel 100% better as soon as possible! My mother in law has always used this exact recipe but with saltine crackers, with the chicken too. I suppose some would find that kinda bland, but they are delicious. Could be a substitute if you don’t have Ritz on hand. I have tried this with saltines, but I just love it so much more with Ritz. I think it’s the buttery goodness! The baked pork chops look delicious, will try them for Easter dinner. Just tried this and it was so yummy! Better than any chops I ever made! And that’s says a lot! Plus it’s really easy! Thank you for publishing this awesome recipe! This is going into my recipe box for sure! Yay! So glad to hear you like them. Thanks so much for stopping by and leaving your feedback! i have my pork chops in the oven now, can’t wait to try them. I hope you loved them, Mary! 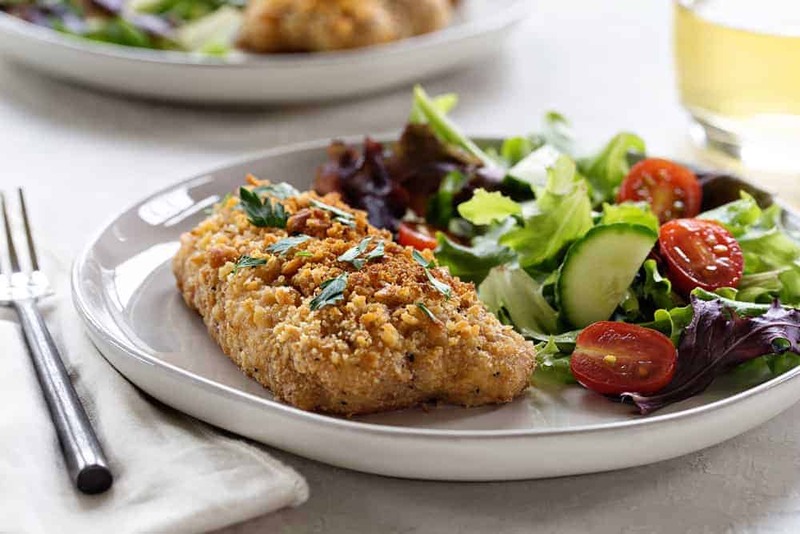 Your Ritz Cracker Chicken is a favorite in my house! Tastes just like Thanksgiving, so I cannot wait to try these! If using Garlic Ritz, should the garlic salt still be used? Thanks! Thanks so much for stopping by, Alyssa! I appreciate you taking the time to comment. Happy Baking! I have my easy baked pork chops in the oven now. I had saltines and excited to try them. Thanks so much for stopping by, Ronda! I appreciate you taking the time to comment and hope you enjoyed the pork chops. Happy Baking!